A huge cliche, I know, but I do like to have my Vegemite and Tim Tams. I have tried the gourmet cookies but nothing tops good old Arnott’s biscuits. This is just a fraction of what was in the box! 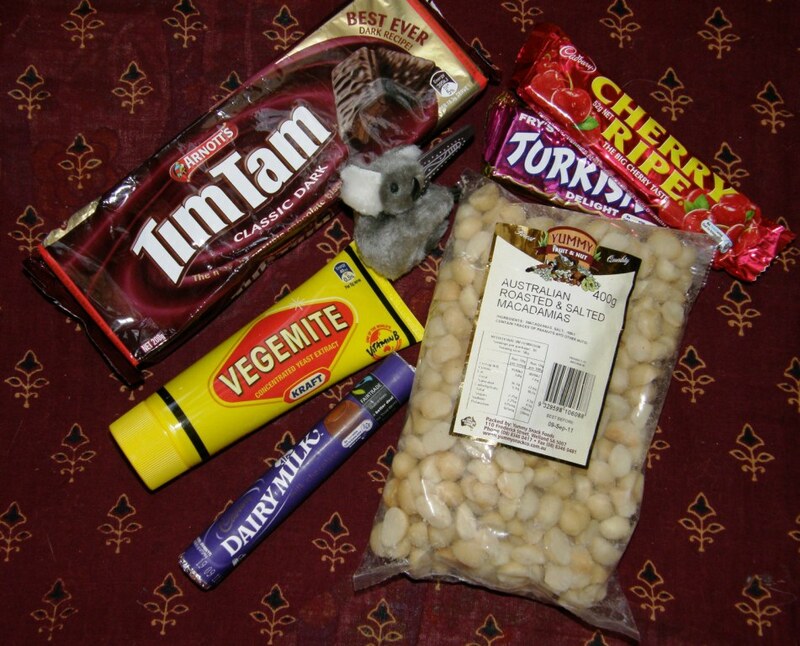 I suppose if I ever go back to Australia I will be having care packages sent from here….dried cuñapes, pots of dulce de leche, facturas, alfajores and “Sublimes“! I must gather them all up so I can show you what they are. It has occurred to me that I get care packages all the time…not necessarily cartons of stuff in the mail box at the post office, but rather, emails from people all over the world with links and photos and information about things that they know will be of interest to me…notes of concern if they hear of a new outbreak of social unrest or natural disaster in this area….words of comfort if life throws me a little disappointment on a more personal level. Nothing says more clearly “I care” than all that. A certain person’s exceeding generosity has helped me to be the owner of this…. 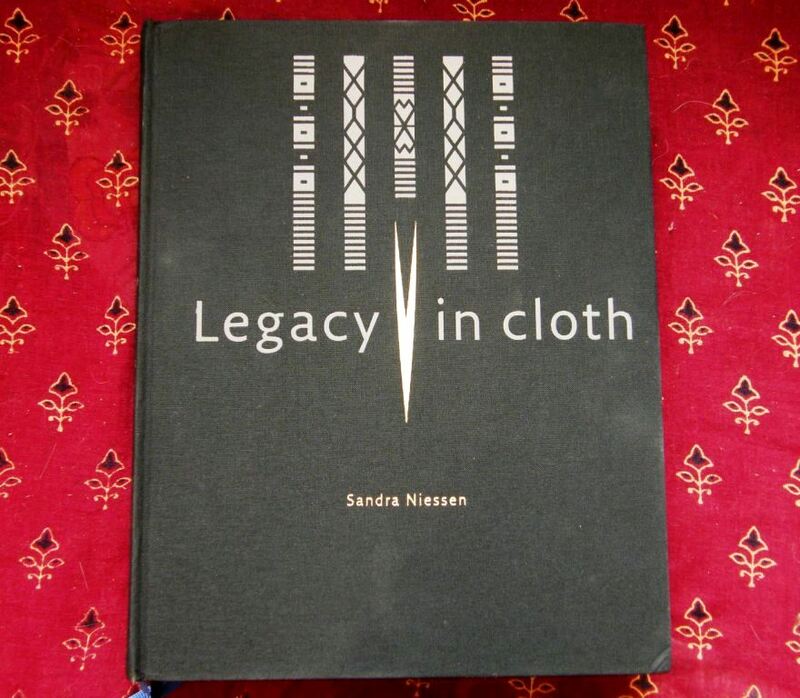 “Legacy in Cloth” – this book contains the results of Sandra Niessen’s thirty years of research on the weaving techniques and textiles of the Batak people of Indonesia. Five hundred and sixty-eight pages of text and luscious photos! I am not even going to touch it until I have quality time available to give it the attention it deserves. This is not something to just flip through. Sandra writes a fabulous blog packed with stories about her time spent in Indonesia with the Batak people, writing the book and then taking the book back to the villages. She is currently in Indonesia making a film on Batak weaving inspired by a Batak poem, a project about which you can read here. Many thanks to Pamela Cross who gave me this information and sent me the link. You can see photos, also generously provided by Pamela, of Batak textiles with their twined edges in this previous blog post. This week there was some time spent at the loom and a lot of time spent at the drawing board, the drawing board being my bedroom floor. I love charting! 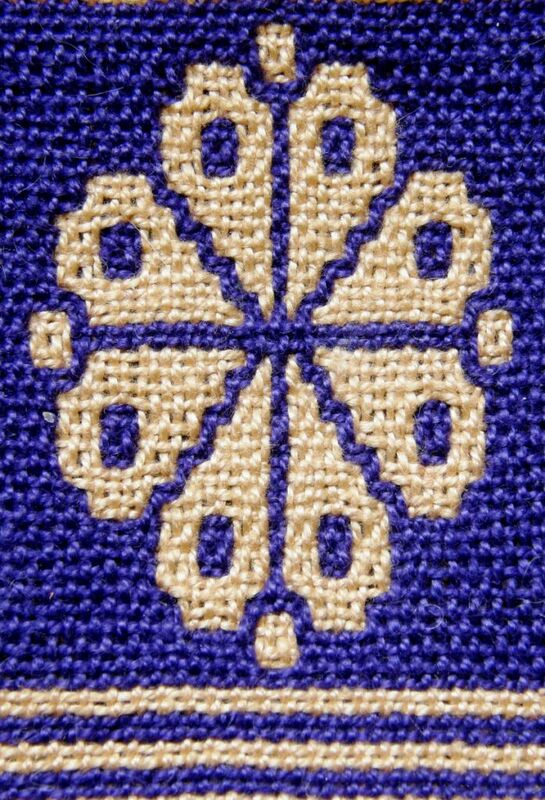 I am still in finnweave mode and made an attempt at reproducing the design on a piece of Huichol weaving that I was able to photograph at the National Museum of the American Indian in DC. This was a great learning experience as I can really see now how my lines on paper transfer to cloth, how much space is created between rows of charted squares etc so that next time I should be able to make this a precise reproduction rather than an “adaptation”. I knew from the get-go that this was not going to be faithful to the original. I couldn’t get the spacing of the outer “spokes” right, for example, but there was really only one way to figure it out…go ahead and weave it. Certain parts came out quite well while others obviously didn’t. Without the comparison I think it stands up as a nice design. I read in one of Mary M Atwater’s articles in Handcrafter (a free download from the arizona archives..thanks Jeannine and Helena) that large areas of solid color should be avoided (much the same as in warp faced double weave) as, in these areas you end up with two separate layers that can tend to bulge and billow. For that reason I wove the three small crosses at the bottom of my replica piece to help fill in that negative space and bond the layers. I omitted them from the top corners so I could compare and found that the crosses made very little difference. I think the design looks less cluttered without the crosses and that it is nice to have areas of solid color if you can get away with it. How amazing is the close resemblance it bears to one of the motifs on this other Huichol piece that I photographed in the museum in DC. 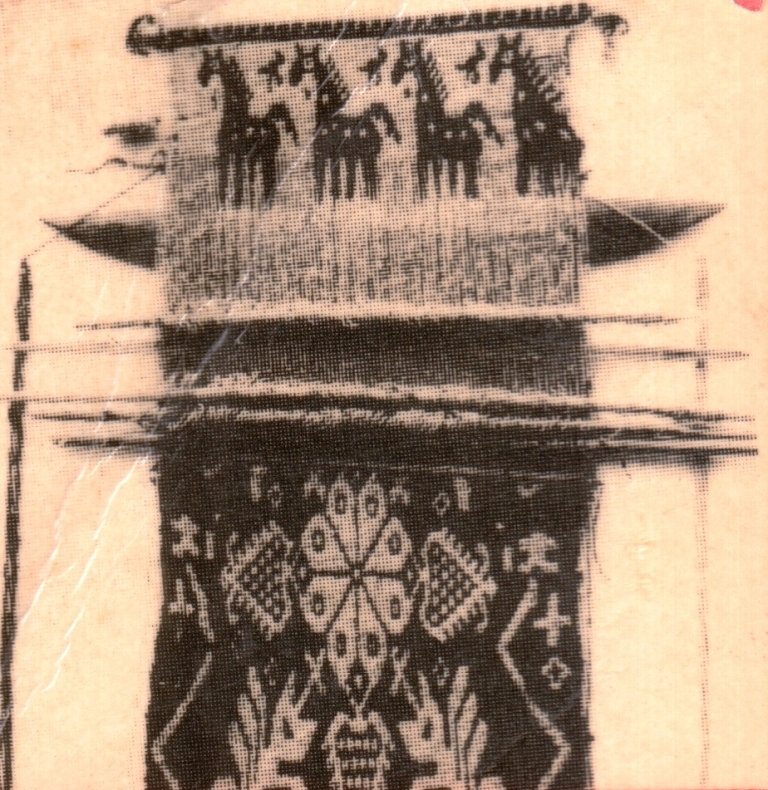 And then I was tidying up my bookshelf and was about to shift my copy of Verla Birrell’s The Textile Arts to another spot when right there on the cover I see a tiny image of a loom and textile with a flower motif that even more closely resembles the Scandinavian one. I guessed that it was a Huichol piece but it turned out to be a double weave piece of the Cora Indian culture of Mexico. So much to learn!! 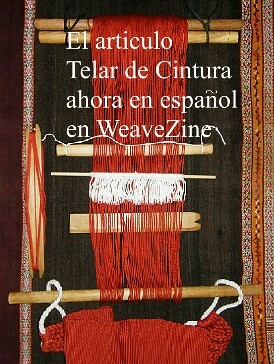 Speaking of books, I managed to find a copy of Atwater’s The Finnweave and the Mexican Double Weave at Amazon. The search for this dates back to when I first started playing with finnweave back in 2008. Can’t wait to read it! 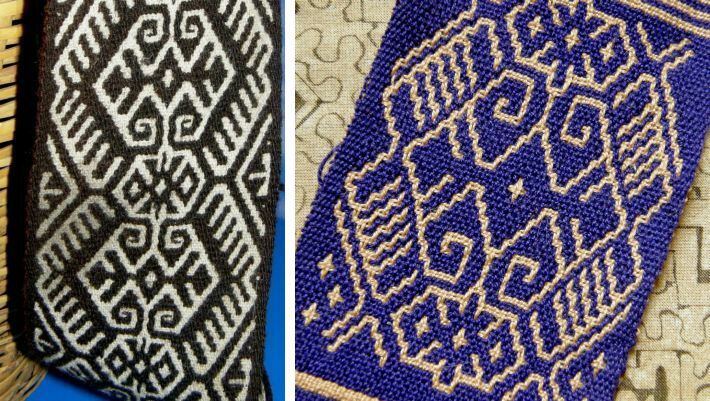 I had been thinking while trying to chart the Huichol piece that perhaps I had made an incorrect assumption and that the Huichol pieces are not, in fact, woven in finnweave technique at all. This world of balanced double weave pick up is very new to me and so the article in the latest Handwoven (Jan/Feb 2011) by Doramay Keasbey couldn’t have been better timed. Many thanks to Caroline for pointing this article out to me. 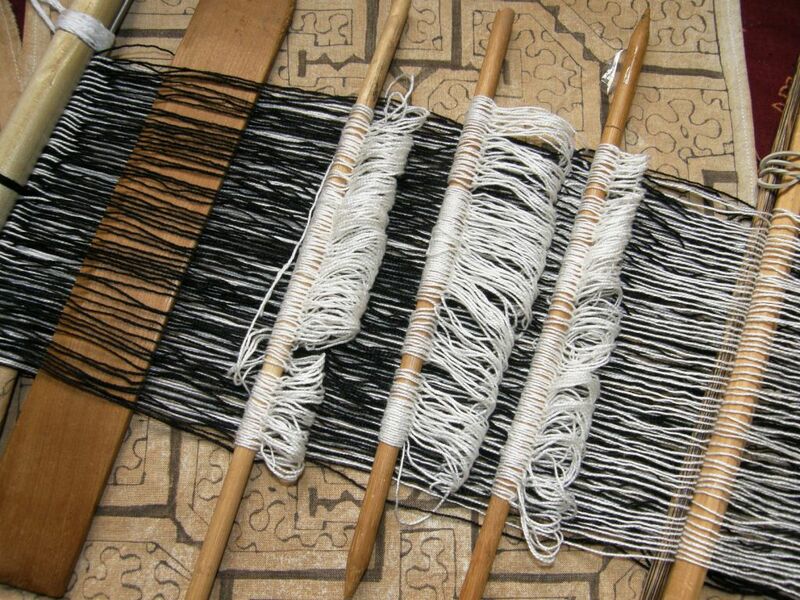 Doramay Keasbey writes about five balanced double weave pick up variations which she has woven in bookmarks showing how both faces of one design look when woven in each of the five techniques. What a nifty article! It has helped me, who has so little experience in this, to see what elements can identify a piece as having been done in finnweave. 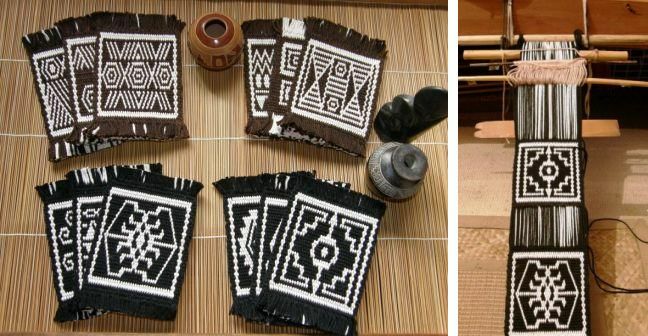 It also helped that Hans Christenssen, who has authored a book on finnweave, confirmed the technique used for the Huichol pieces. 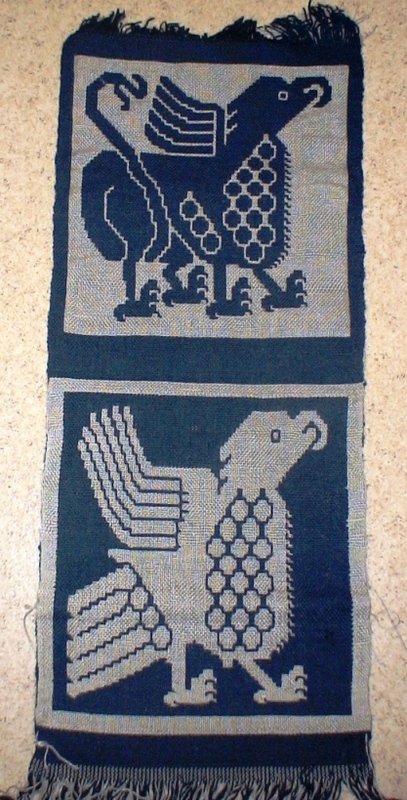 He also gave me some background on the piece I showed last week that was woven by Weavolution member Manicgirl. Manicgirl has disappeared from Weavolution for the time being and I hope she comes back soon to find out why her ears are burning so! On top of giving me this link to the original piece in a Stockholm museum (click on the image in that link to see a much larger view), he told me that it is a 15th century piece from Grodinge, Sweden that has been analysed and reproduced in part by Ulla Feltzing, THE expert in finnweave in Sweden..
Two motifs from reproductions that Ms Feltzing made were the subjects for these two beautiful Swedish postage stamps and instructions for weaving some of the motifs appeared in an issue of Vavmagasinet. Now you see how I have wandered off again. This all started with a desire to reproduce some textile fragments of pre-columbian Peru and now here I am in 15th century Sweden. These were made in a 12wpi cotton and are super thick. In order to get the detail I want in the finnweave designs I will need to use finer cotton and make larger squares, around 5 1/2 – 6″ and so I will call these “table toppers”…something on which to pose a small pot plant or a bowl of candy or whatever. And if you are thinking that this sounds like just an excuse to weave something you are right. I don’t actually have a clear table on which to put these! And now to chart the designs and make adjustments to my first reproduction attempt. 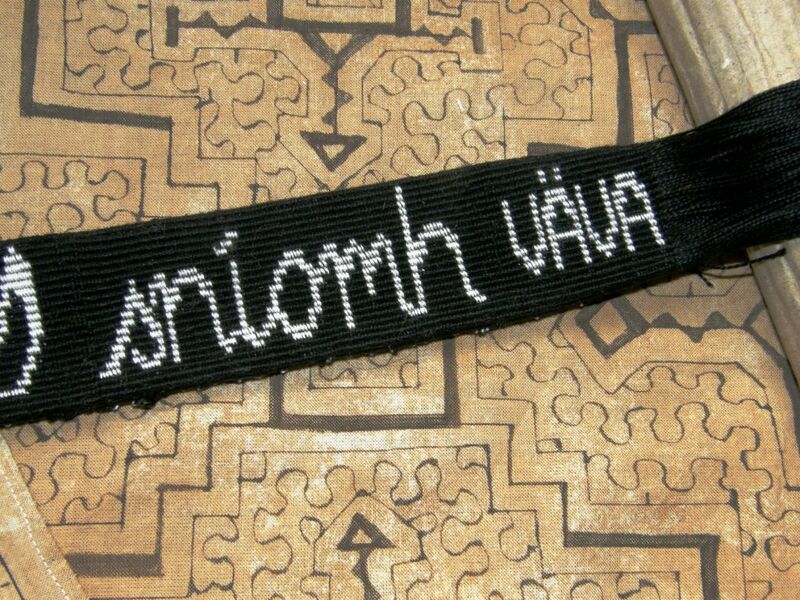 At left you will see that I finished twining the Gaelic word for “weave” on my bag strap and have added the Swedish one. Next stop…Nigeria. I didn’t get a start on the Margarita braid for the zipper pull – maybe this week. Something I learned this week from weave-along participant, Barry: there is such a thing as bonded nylon and apparently it makes great heddle string. All the weavers I saw in Guatemala use nylon for their heddle string. None of the weavers I have encountered here do. They use their warp yarn for heddles and I do too. 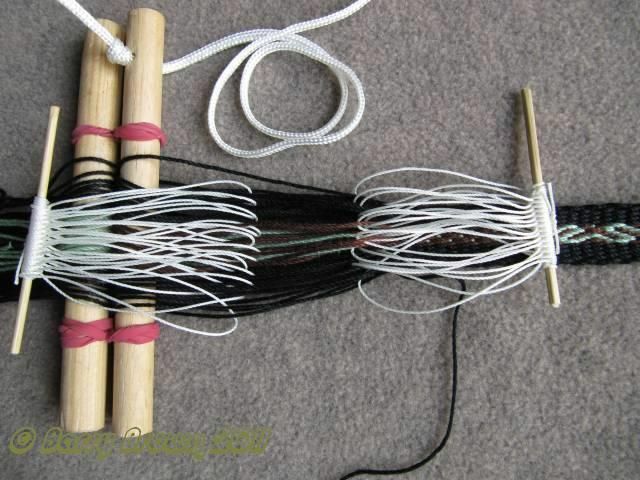 I hate nylon…it’s slips around on the heddle stick and won’t hold knots – horrid stuff. But, apparently this bonded variety is very cool. This is the picture from the Memphis Net and Twine Co web page. Barry has been using size#6 which he says works well with the #3 mercerized crochet cotton thread with which he is weaving. Using nylon cuts down on possible abrasion of the heddle string on the warp which can cause pilling. Excessive pilling will be a problem as warps will eventually start sticking together. Those who have been backstrap weaving for a long time will have learned to open their heddle shed with the minimum of abrasion but for those just starting out, this pilling can be a very annoying problem. Apparently this bonded nylon holds knots well…yay! Below you can see Barry’s loom with bonded nylon heddles nicely gripping the heddle stick. 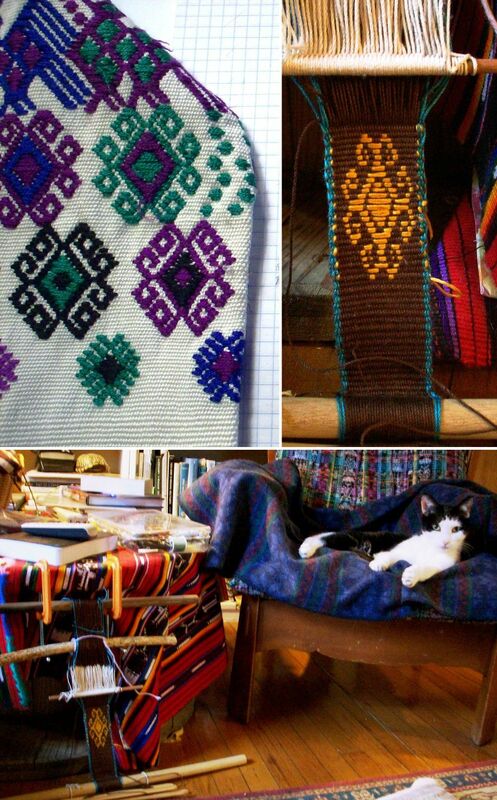 Linda sent me these pictures of a supplementary weft patterned band she is making which has been inspired by a design on a Guatemalan huipil. She built herself a mini warping board and, wise woman, is making short pieces suitable for keyfobs and bookmarks while she learns the techniques. Last I heard, the blizzard has kept her at home and she is trying horizontal stripes and four-stake warping. Marsha wove her dog, Wiggles, into her simple warp float band. She was inspired by a dog she found charted in one of Mary M Atwater’s books. I have seen that dog and Marsha’s is way cuter. Helena in Brazil wove this piece and showed it on Weavolution. It is destined to be a waist pouch for her sister. 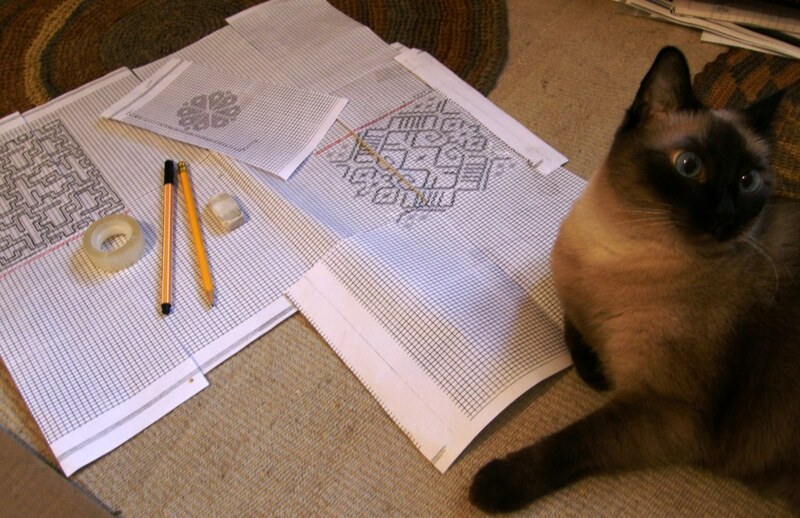 The center pebble weave design is charted in my book. 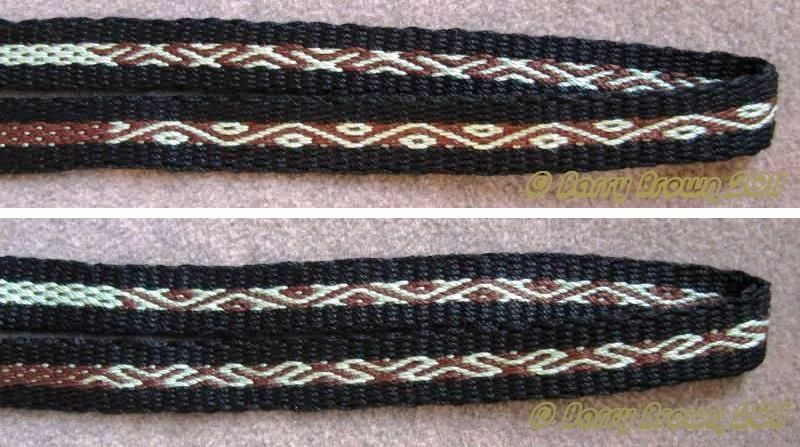 Wanderingskopos (Reetta from Finland) is using the practice patterns that I provide in the one-weft double weave tutorial to make her first double weave band. 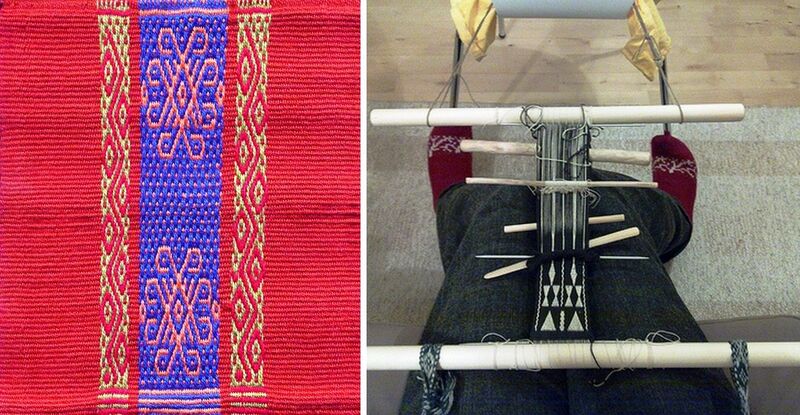 There is an online workshop on the traditional Sami band weaving of Scandinavia being run in the Yahoo Braids_ and_ Bands group this month of February. Sue Foulkes is presenting the workshop and, if you follow the second link, you can click on the image in the top right hand corner and see some examples of Sami bands. Although they are warp faced, they are traditionally woven with a small rigid heddle on a backstrap loom. The files will remain in the group’s archives if you are unable to participate in the workshop this month – always more fun to do the workshop though. Last November Sue presented a workshop on Baltic Bands, also done with a rigid heddle, in the UK Online Guild of Spinners, Weavers and Dyers. You can see some images of the bands members produced on their public web page. Kimberly Hamill, a wonderful backstrap weaver whom I met at Convergence last year, is giving a backstrap weaving class March 11-13 at Weaving Southwest in Taos. 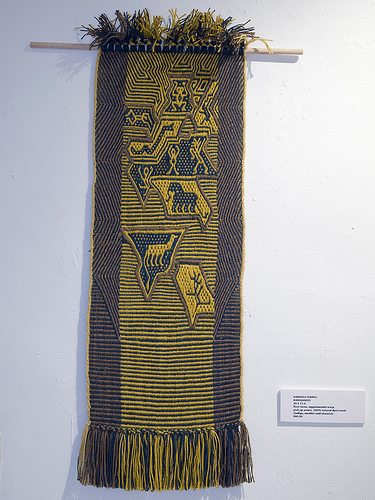 You can see one of her backstrap woven artworks at left which has been accented with a little embroidery. Finishing off here and going back to the loom…. I would like to give a big thanks once again for all those behind the scenes, too numerous to name, for all the wonderful “care packages”. Just have to ask – What is Vegemite? Made by Kraft, no less! It is something that you kind of have to be raised on to appreciate. I used to make my English students “experience” it so they could practice phrases like “it looks like, smells like, tastes like…” This description probably won’t help at all…it is a sandwich spread and is black and and very salty. It is actually a yeast extract. Have you ever heard of Marmite?…very similar but far superior! beside that,as usual I loved your blog, and glad you got a care package, it’s always lifting the spirit..
As usual, your blog is both inspiring and informative. One question though: do you re-use your string heddles on more than one piece? Seems like a lot of work and waste to throw them out each time. When I travel and don’t want to carry a lot of stuff, I reuse the heddle string picking off any clumps of fluff with a needle but it doesn’t save any work, it just saves about a yard of thread as I work on small warps when I am away. In fact getting the heddle string out in one piece and picking off the fluff is more work. You still have to reinstall the heddles. Making string heddles is just one more part of the whole warping process and is not a big deal to me. It is faster than cutting and threading ends through a rigid heddle, for example.